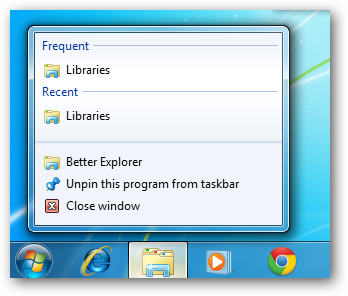 You either love the new explorer ribbon in Windows 8, or you hate it. For those of you that like it but aren’t quite ready to install it, heres how to get a replica of it in Windows 7. Note: The program is still in its alpha stage of development and there are a lot of bugs, continue at your own risk. Go to Codeplex and download a free copy of Better Explorer. The installation is easy and requires is of the next, next, finish kind. Better Explorer does not replace the Windows explorer but rather adds itself as an additional program. 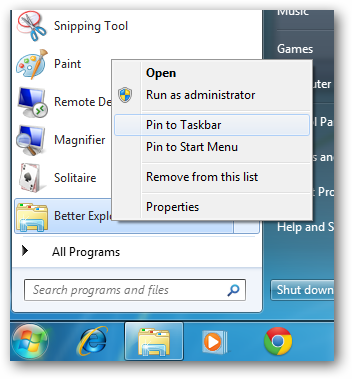 To make it more easily accessible unpin the normal Windows explorer from the taskbar. Now pin Better Explorer and move it to where the old explorer use to be. Now you have easy access to Better Explorer.